Remember this summer classic from when you were a kid? Well, it's back and it is big enough for you and the kids! Favorite summertime inflatable, just add water and the let the fun begin! This Slip-N-Slide is 8' wide by 33' long. Water jets spray the unit down while you slide down this super-slippery slide. For fun add tearless baby shampoo for a super slipper and sudsy time. This Slip-N-Slide is 8' wide by 33' long. Water jets spray the unit down while you slide down this super-slippery slide. For fun add tearless baby shampoo for a super slipper and sudsy time. The Slip-N-Slide requires a relatively flat area or a slight slope about 10' x 35' and within 100' of an electrical outlet and close to a garden hose. The water and the blower both remain on while the inflatable is operating. This unit has a weight limit of 150 pounds per child. 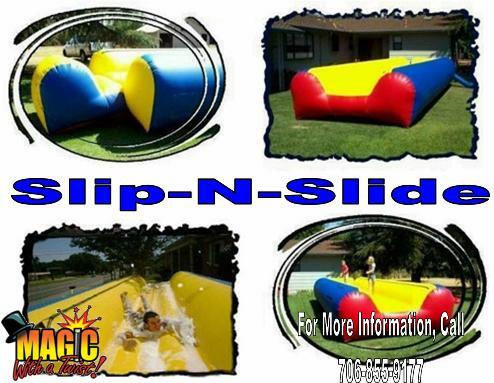 An adult must supervise the Slip-N-Slide at all times while it�s being used. The slide water must be turned off at the end of your event. The slide then must be rinsed off with fresh water to remove any soap and dirt. The blower must then run for 1 hour prior to pickup time in order to allow the unit to dry. This unit must be setup on grass.